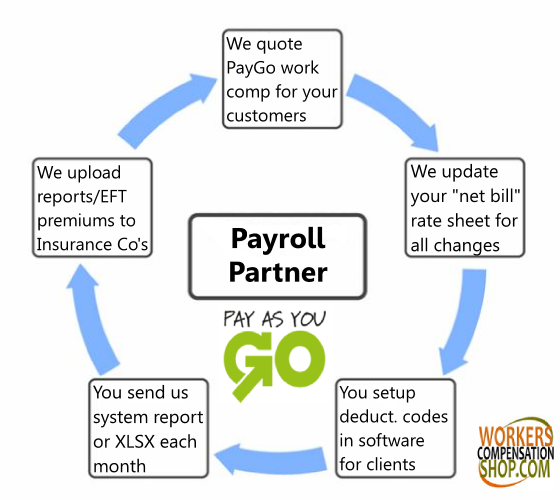 Pay As You Go Workers' Comp Partnerships for Payroll Service Bureaus. We help payroll service bureaus help customers and compete with big box payroll companies like ADP and Paychex. Give us a call at 888-611-7467 to learn how we can help your payroll business offer PayGo and other lines of commercial insurance. We help payroll service bureaus win and keep more payroll with our back-office Pay As You Go workers comp solutions designed to integrate with your payroll software and sales process. We provide access and support to more insurance markets than the other PayGo solutions, which means you won't have to tell a prospect that your current insurance market is not able provide them with a quote. 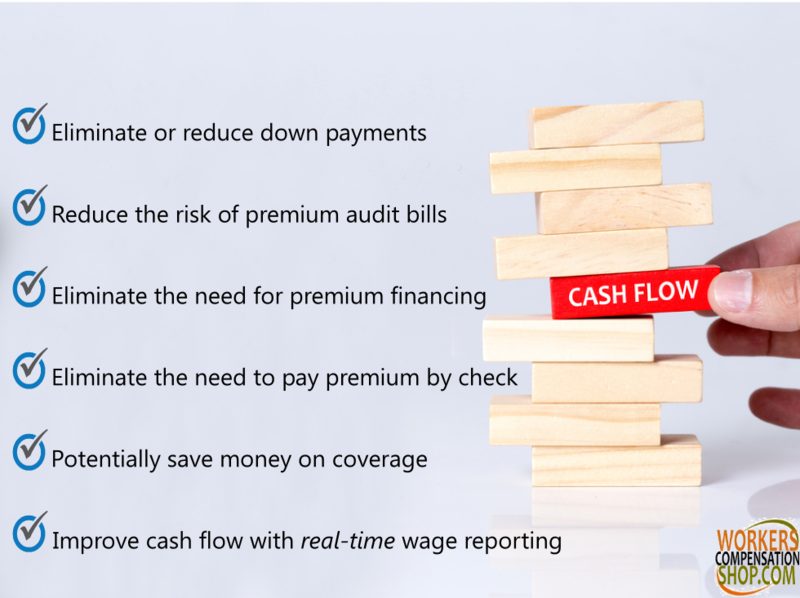 With over 15 PayGo carriers and dozens of other additional markets, we help you solve insurance problems for customers and improve cash flow for both white-collar industries and hard-to-place risks. Plus we pay our partners a transmission fee each month for each client being reported to us. Our processes are flexible to ensure we make life easy for our payroll partners. Our goal, as a national agency specializing in workers' compensation insurance and commercial lines coverage, is to share our agency knowledge and experience with smart payroll entrepreneurs looking to offer better solutions to their payroll customers and prospects. Our proprietary reporting process is simple and works with any system generated workers comp reports created by your payroll software. We also provide and accept spreadsheet reports and have customer support staff who can assist with manual reporting and customer audits. We accept individual client reports or one master report for all your payroll clients using our program regardless of which insurance company we placed your customer with. This means you don't have to track which customers are written with each individual insurance company. Our process works on a calendar month basis, or per pay period, which means less administrative work. Our system is flexible and enables our partners to bill/collect premium as part of the payroll process or report only and authorize us to ACH from customer accounts. We make it easier that ever to offer Pay As You Go coverage that fits your needs. If your payroll company already works with one or more insurance carriers, we can help fill the gaps and provide back-office solutions for hard to place coverage, or help with additional lines of coverage such as liability insurance, data breach, bonds, and commercial property or auto. If your payroll company does not currently offer Pay As You Go workers compensation to your customer, our dedicated Specialists can help you market this program as a benefit and position your company as a better alternative to other payroll solutions. We help small and mid-sized payroll companies protect their accounts from larger payroll providers like ADP and Paychex. 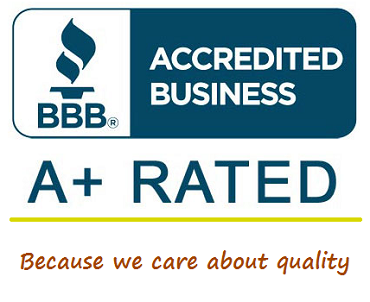 We have over a decade of experience working with small business owners throughout the United States. We've been helping payroll companies, accounting firms, and small independent agents place insurance business since 2004. We're currently looking for new partnership opportunities with select payroll partners that simplify and solve insurance-related issues for business owners. Give us a call or contact us today to learn more about our affiliate programs for payroll bureaus. We've been working with payroll service providers to offer back-office insurance solutions and support since 2004, making us one of the national leaders in Pay As You Go workers compensation insurance. We have access to more insurance carriers and commercial insurance products than most local and regional insurance agencies due to our size and premium volume. Our Pay As you go reporting methods are simple and flexible to fit the diverse needs of just about any payroll service partner. We help payroll service bureau build revenue steams with our affinity programs and data transmission payments. We also work with licensed agents associated with payroll companies. Affinity Programs for Payroll Providers. We are a national leader in Pay As You Go workers compensation coverage and we provide back-office access to payroll companies and licensed insurance agents. We help you win more business. We want to help your organization keep customers satisfied with fast and easy commercial insurance solutions. Find out just how easy it is to offer high quality insurance products and Pay As You Go programs to your payroll clients today. Call 888-611-7467 or contact us online.